Our story began in September 2004 when thirties-something couple, Kylie and Mike, went to the Lort Smith Animal Hospital to choose a dog. They had been given a voucher to adopt two dogs as a wedding present from their siblings. It was not the first time either of them had owned pets, but it was to be the first time they owned any as a couple. So, a day after returning from a five week honeymoon, they went to the Lort Smith to see which dogs needed a new home. It was sad for them to see so many lovely dogs desperate to go home with them but when they came across us in the inside pens, the choice was obvious. We were in a pen together, snuggled up, or chewing each other’s ears. There were two little girls, our sisters as it happens, in the pen next to us but they had been mean to us and had to be kept away. Adam the kennel manager had quite a long chat to Kylie and Mike about what sort of dog they wanted, how many, their prior experience with dogs, and quickly determined they were a responsible, caring couple who would be perfect parents to two needy little fur babies. Kylie and Mike wanted two dogs but hadn’t decided whether to get one first and then six or so months later introduce a second dog to the family. We’d obviously charmed Adam and he didn’t want to separate us – he said he’d been watching us and we were such great little mates that if they wanted two puppies straight away, they could take us home the following week. Kylie and Mike’s sisters came to meet us the next day – we put on as much cuteness as we could muster – and the decision was made. A few days later (after our little ‘op’ to make sure there were no more unwanted puppies) we were on our way home to start our new life. We were very small but big on cuteness! My name is Ralph and I’m going to tell you our story. My little brother Rupert will pitch in now and again but he doesn’t know quite as many words as I do. After a short car ride which was fun – we just sat in the back with Kylie, our forever Mum, hanging on to each other, wondering where we were going – we arrived at our new house. To little pups – we were very small and no-one really knew how old we were – it seemed like a palace compared with the pen we were in at the shelter. Kylie and Mike, now we call him Mikey, had created our own play area at the back of the house. We had access to the garden for wee wees, a long hallway to run and chase along, a very comfy cardboard box with blankets to sleep in, a clock, toys and a hot water bottle. 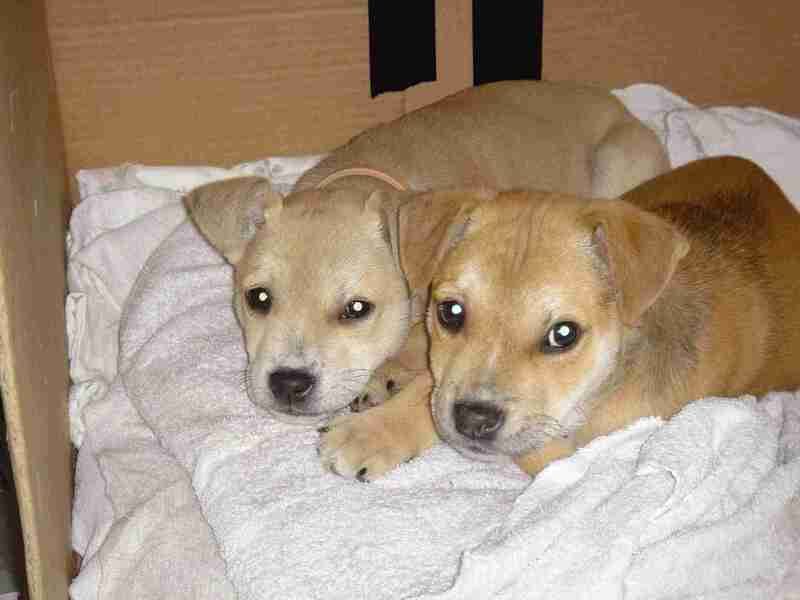 For two abandoned pups who didn’t know which way their life would turn, we were in heaven! We only cried a couple of times for the first few nights – not for our previous life, as that wasn’t much fun, but for our birth mum – we still wonder what happened to her and what she looked like. However, we soon settled into our new routine with Kylie and Mikey and became model fur-babies. I bet you’re wondering how we came to having such cool names? Well, Kylie and Mikey got married at Rupertswood Mansion the month before we met them. As we were wedding presents, it seemed only logical that one of us would be called Rupert. I’m not sure how Rupert got to be called Rupert, but now that I know him better, it suits him. And of course they needed another ‘R’ name and Ralph just seemed to fit my cheeky face to a tee. So, from then on, we became Rupert and Ralph, the terrible twins! As with all good Aussie families, we had to shorten or lengthen our names, so we’re often called Rupie and Ralpie, even Scupie and Scalphie! Is it any wonder it took us a while to learn to come when we’re called – we’re not sure who they’re calling sometimes! Our first week was relatively uneventful – Kylie and Mikey took it in turns to race home from work at lunchtime to give us our mid-day meal and check that we were ok. There was lots of changing of newspaper on the floor too as we hadn’t learnt to go outside yet – we were way too little to be out on our own anyway. In the evenings, we’d al l get to play together and learn about each other. Sometimes when we woke from a snooze, we’d notice Kylie and Mikey just standing together watching us – it was very sweet and we knew then that we had fallen on our feet and were going to love being part of this family very much. A week later, Mike and Kylie were taking us to puppy school for the first time. We were nearly there – it wasn’t far, but too far for our little legs – when I heard Rupert groaning in his corner of the back seat of the car. “ Ooooh Ralphie, I don’t feel very well. My tummy’s sore and I think I’m going to be sick”, he said, just before he threw up all over the place. Mikey stopped the car but before he could take Rupert outside, he threw up again, and again and again, all the way back to the Lort Smith Hospital. I said, “what’s wrong little brother? Are you going to be ok?”. Rupert looked at me with very sad and sorry eyes and said “I don’t know what’s wrong Ralphie but I feel really sick and I’m sorry for the mess but I can’t help it. Please get Mikey and Kylie to take me to the hospital quickly so they can find out what’s wrong with me. Oooh, my tummy…”. Categories: Short Stories | Tags: adoption, puppy love, short story | Permalink.